Mokii is a city that exists only in the minds of its inhabitants. It’s not easy to get past the bouncer but once Olga is inside she has to fight off intruders eager to take over the city for the lucrative virtual advertising. Olga enters Mokii on a mission, but not a mission you might expect. When she is presented with a tray of silver thimbles filled with a ruby and emerald elixir, she can thought-call people, tag them, run through crystal corridors and helical stairways, and think a switch and it will all go away. But in this physical reality where pleasure is mostly in the mind, can we really know what is real and what is not? Having not read science fiction before, I was pleasantly surprised by the sights and sounds in this unpredictable and delicious mind-spa. Mokii is a place where décor can range from a ‘cross between Titanic and a Cinderella nightmare’ and where avatars change at will. An original and exciting concept that will bend the senses and catapult the reader into another world. Click to read about... 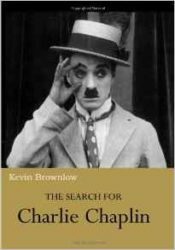 The Search For Chalie Chaplin by Kevin Brownlow ebook NOW £3!